This year my word to grow into is organized. It’s not that I have never been organized. 2011 was a year that literally threw me in to spiritual, physical and emotional directions that I never imagined. I lost my mom after a severe stroke, several family friends endured the death of loved ones (one was a strong, courageous twenty one year old man), the third of our four sons took a job in a state on the opposite coast, one son with a graduate degree had no job, and I was in the midst of my first year of a new appointment. I spend time in silence every day, a practice that is as life giving for me as drinking water, so somehow, I kept my balance. I hope that 2012 will be a year that furthers the possibility for some of my dreams to make way into reality. I plan to spend time every day using paper to create images, using both words and color. I plan to do the physical training for a two month hike in Europe in 2013. I plan to see three of our sons in their new places of employment and find a college for our fourth son. I hope to train my sweet aussie, Ruby, and am thinking this is the year she might learn English. I hope to help the congregation that I serve God with to discern and give voice to a vision that will carry their ministry into the community in faithful ways. I think I need to be organized, don’t you? I started with a professional organizer redesigning and developing the space I work in every day. 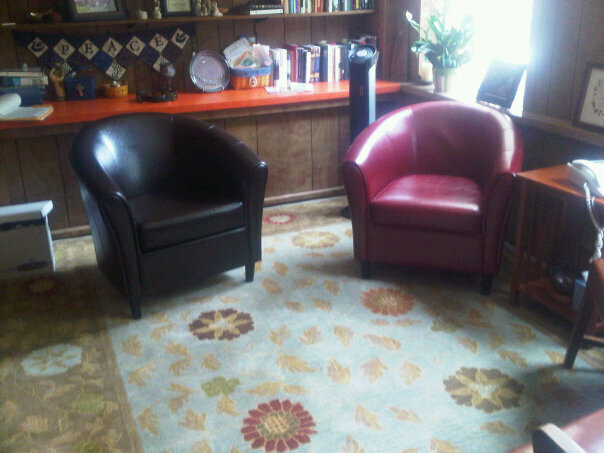 The central focus is a lovely carpet with four comfy leather chairs(one of them is bright red!). My puppy Ruby has her own special spot in my office. Being organized helps me convey welcome. I look forward to a year of organizational benefits! I look forward to following your blog of dreams & accomplishments in the year 2012.